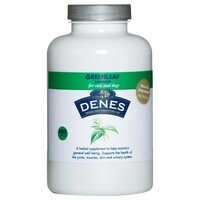 Denes Greenleaf Capsules for Cats and Dogs are a licensed herbal supplement for the symptomatic relief of arthritis and to help maintain general wellbeing. Based on stinging nettles which have a natural anti-inflammatory action effect and cleansing effect on the body, Denes Greenleaf Capsules help to remove toxins and other unwanted metabolites, which can cause symptoms such as a joint pain and stiffness. Denes Greenleaf Capsules encourage these Free Radicals to be eliminated through the kidneys, helping to relieve the symptoms of arthritis and to improve mobility.